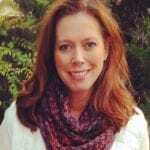 Colorado is known for outdoor recreation and miles of beautiful hiking trails. 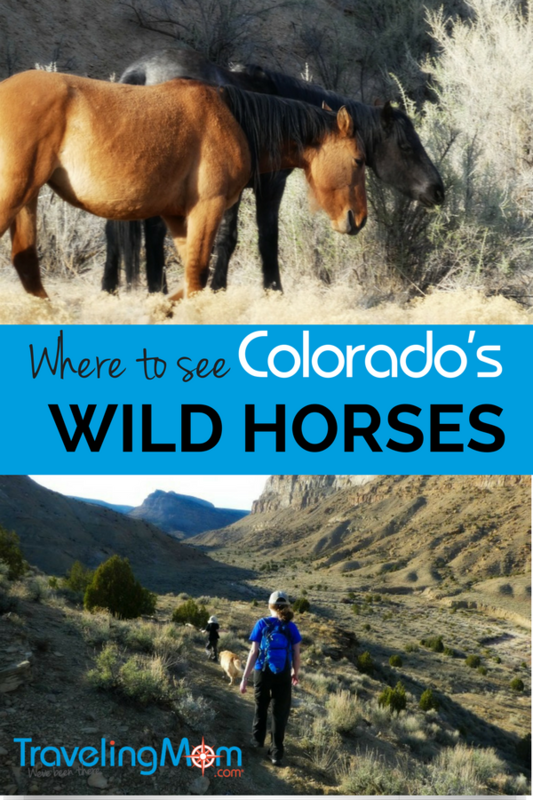 But did you realize it’s also home to one of only three areas in the United States set aside specifically for wild horses? 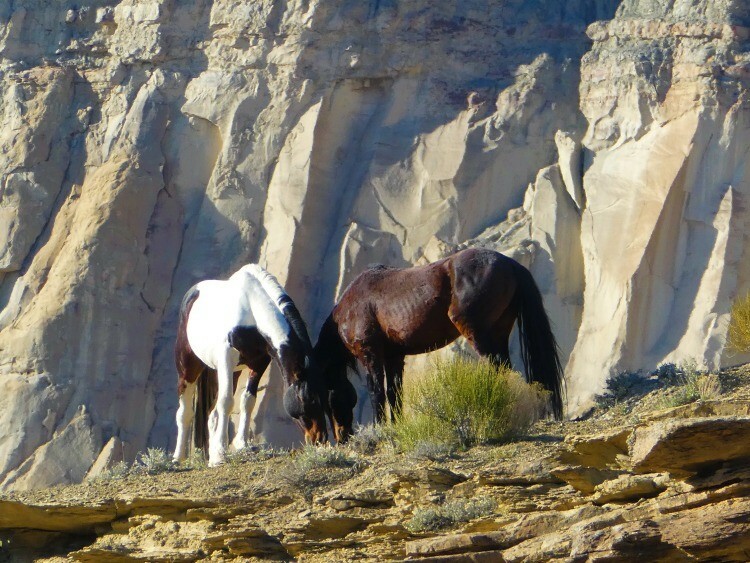 Little Bookcliffs Wild Horse Area in Western Colorado is easy to find, free to access, and open year round. Here’s what you need to know to plan a fun day adventure there. 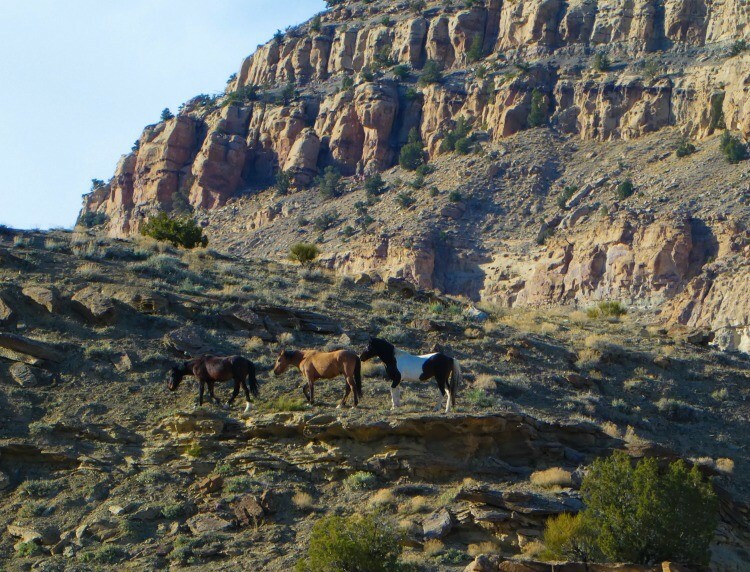 A hidden gem of western Colorado, Little Bookcliffs Wild Horse Area is home to a beautiful herd of wild horses. This sizable area is over 36,000 acres of public land, managed by the Bureau of Land Management (BLM). 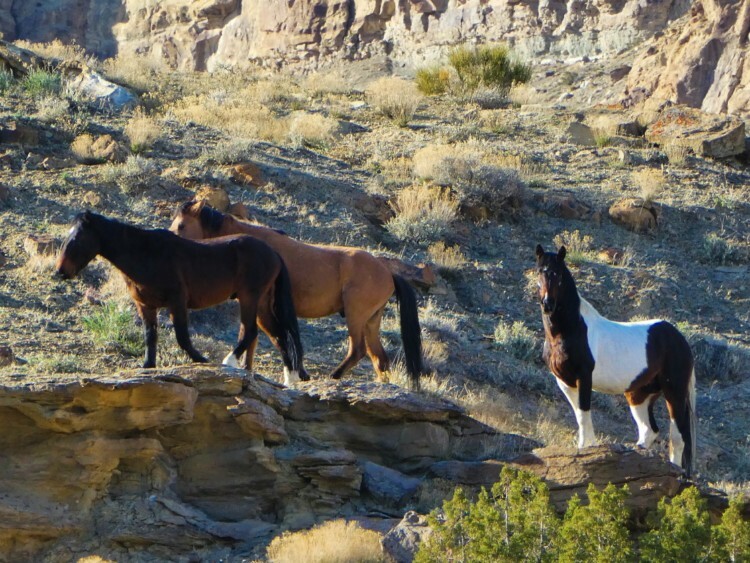 The herd is comprised of hearty mustangs, and ranges in size from 90 to 150. 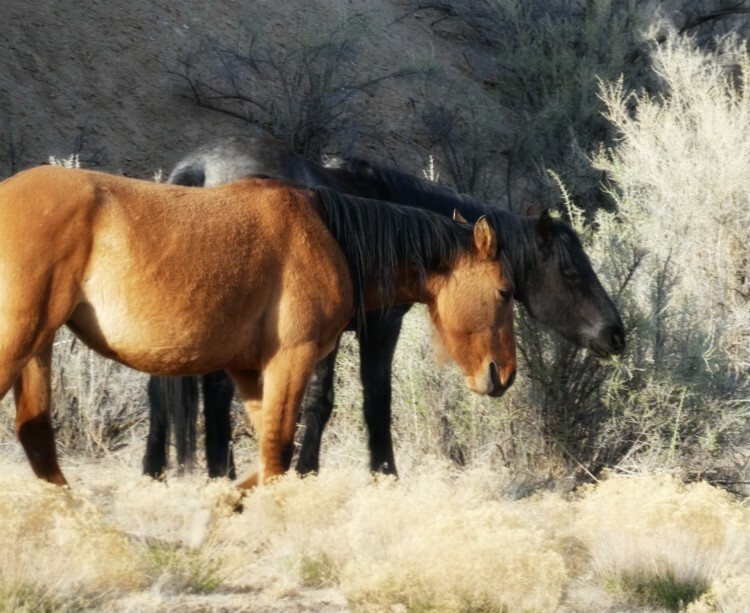 A group called Friends of the Mustangs works with BLM to ensure that both the range and the horses living here are kept healthy. They also assist in annual roundups, and in finding adoptive homes for any animals culled from the herd. Although it’s a bit barren, I personally love the Little Bookcliffs for its outstanding, distinctive Western US beauty. Rugged slopes lead into a valley dotted with sagebrush and pinyon-juniper trees. Although the 4×4 road leading further into the area is closed to motorized traffic from Dec 1 – May 30, there is still free year-round access on foot or horseback. It’s a wonderful place for families to hike, with plenty to keep kids excited about the adventure. These lovely beasts move constantly, as they forage for food. 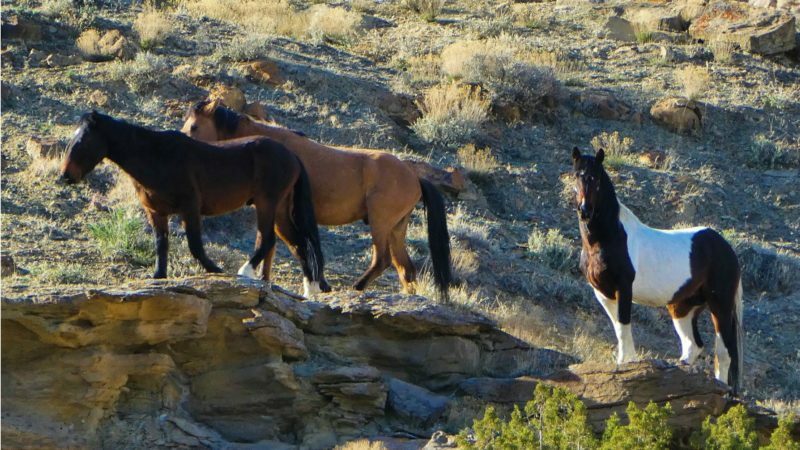 Although the area is vast, and seeing the mustangs can be luck-of-the-draw, we’ve had success spotting them on a few occasions. 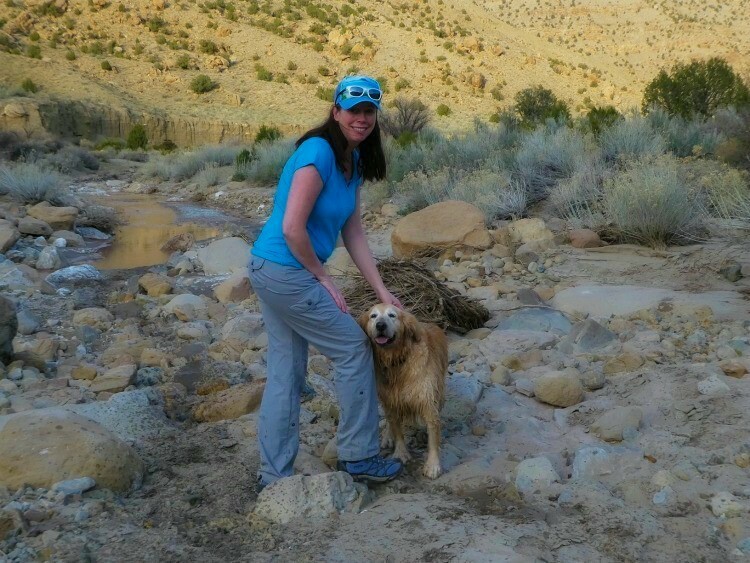 With the arrival of warm spring days, I’ve been anxious to get out and go hiking or mountain biking. 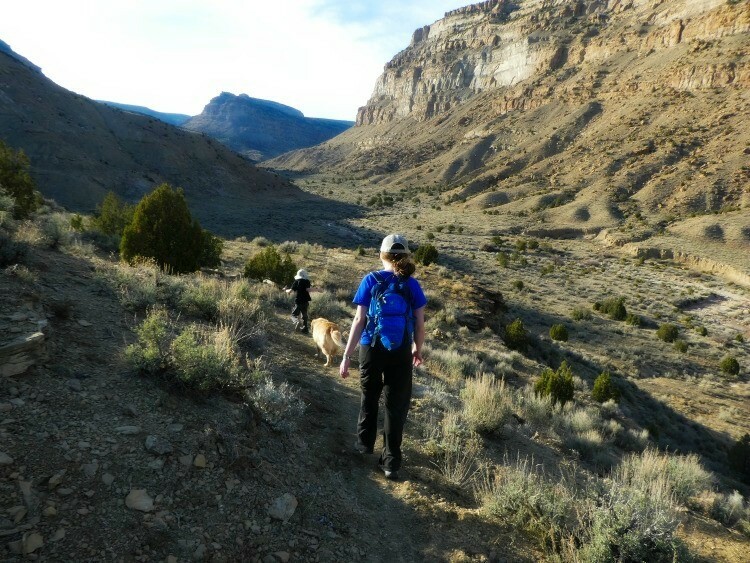 Living in Western Colorado offers us numerous types of terrain, and miles of trails to explore. Hey, when a hike leads to a lake, waterfall, or cool rock formation… that’s perfect. 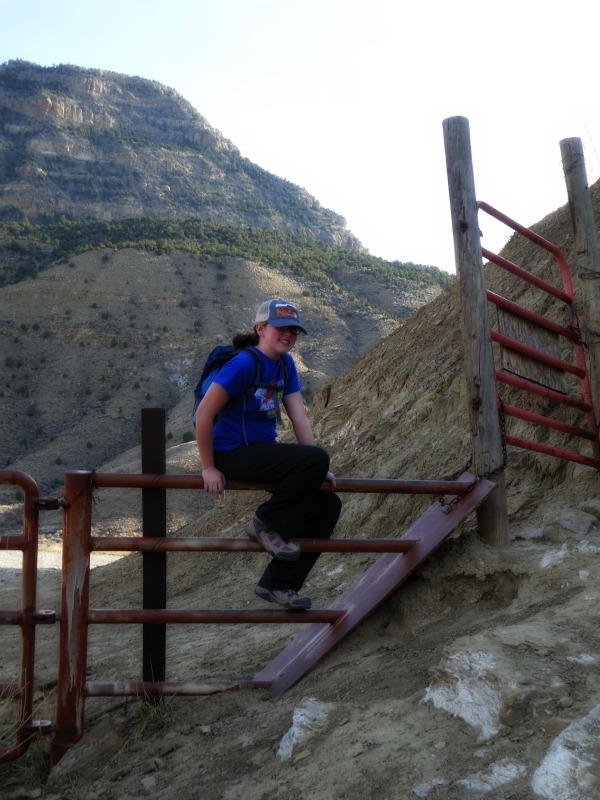 It’s a nice motivator to keep kids interested and making forward progress on the trail. The prospect of seeing wild horses? Even better. Ultimately, this was our deciding factor last weekend when we headed to Little Bookcliffs Wild Horse Area. Pack a lunch, and this can serve as a fantastic spot for a day hike. However, we enjoy the area even when we only have a couple of hours to spare. We always bring plenty of water, and usually some snacks in case our energy runs low. I’ve been a horse lover my entire life. Still, there’s something truly special about seeing a horse run free in the wild. 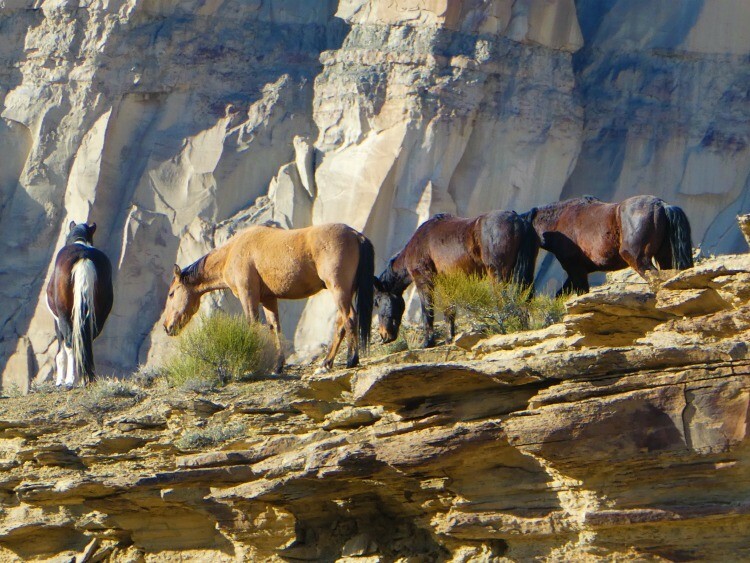 During our most recent March hike in this area, we spotted three different groups of mustangs. We saw the first horse along a rocky cliff side immediately as we exited our vehicle in the parking lot. We’ve seen this distinctive brown and white stallion before. It’s my belief he’s the leader. The trail starts with an incline, and a path so wide it’s almost like a road. Visitors pass through a gate area, which is easy enough to navigate. This is on the honor system, so don’t let the horses out! Unwrap the chain to swing open the pedestrian gate, or just hop over the fence. Next begins a descent into Coal Valley. 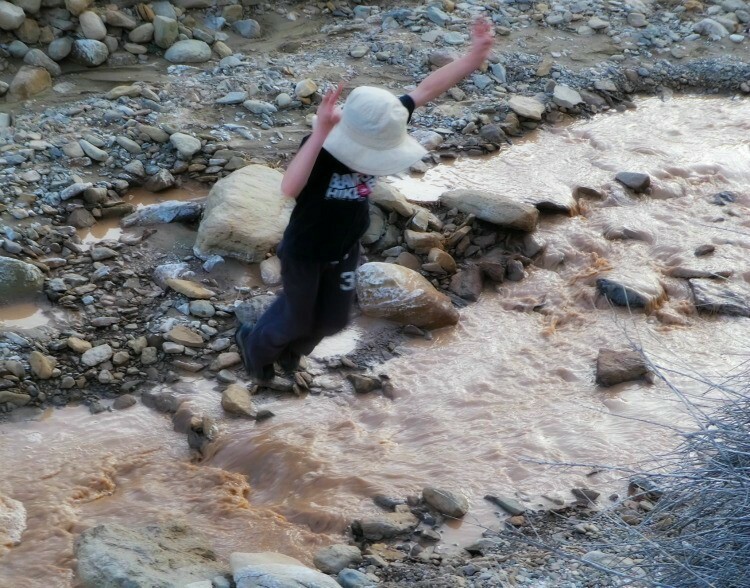 A muddy creek runs through the bottom in spring, providing a perfect place for young ones to puddle jump. Exciting terrain for a 6 year old boy! My tween daughter, however, was all about seeing those lovely horses. And capturing a new Instagram profile shot of herself, of course. Me, I was there for both. Although rugged terrain, it’s an easy place to hike. We didn’t have to go far to witness this impressive vista. Normally in the wild, I wouldn’t get too close to the animals found there. It’s obvious these horses are used to seeing people, and are not too bothered by the intrusion. Had we been disturbing them, they could retreat quickly, having plenty of ground. We walked up fairly close to one group and watched them for a bit. My recommendation is to head to the Coal Canyon entrance in Spring, when you might even catch a glimpse of a foal. This entrance is easy to find. It includes a trailhead and sizable parking lot, and is just 4 minutes off of Colorado’s I-70. 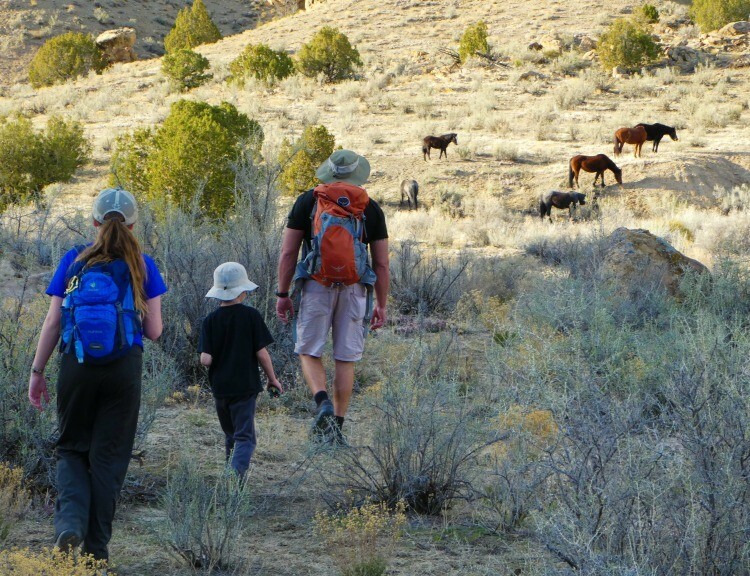 From that starting point, we’ve found numerous hiking and horseback trails leading into the Little Bookcliffs Wild Horse Area. There are actually two access points to the area, but again, we prefer Coal Canyon. It’s not hard to locate, and is mere minutes from Grand Junction. From Grand Junction take I-70 east to the Cameo exit (Exit 45), cross the Colorado River and drive past the Public Service power plant. Stay on the main road. Follow the road westward for approximately 1.5 miles to the trailhead. Hiking is permitted here year round.